Our enforcement teams at the Driver and Vehicle Standards Agency (DVSA) recently supported a major operation to target foreign offenders using the roads. 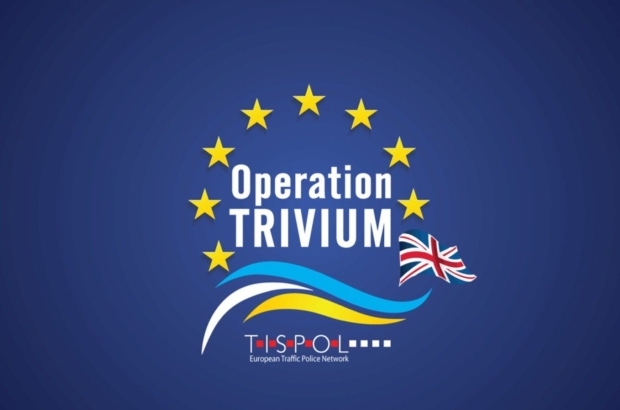 Operation Trivium 7 took place from Monday 21 November to Friday 25 November 2016. During that week, I got the chance to visit a few check sites and see what happened during the operation. I work in DVSA’s External Communications team. I only joined DVSA in October 2016, so this was my first chance to get out and see the enforcement work DVSA does first hand. Working in an office all day it can be easy to forget that a lot of the work DVSA does is going on the at roadside - whatever the weather, as I found out on a particularly rainy day! This was a great opportunity to get out and to chat to our enforcement staff, understand the work they get up to and see the type of defects they’re finding on vehicles. Throughout the week, I got to see how our enforcement staff work with the police and other partners to stop and check vehicles and drivers' details. We regularly work with other organisations on operations that protect the public from unsafe vehicles and drivers. This operation was no exception and involved a huge amount of work from lots of different organisations. A national control centre was set up in the West Midlands, with representatives of Europol (the EU’s law enforcement agency) based there throughout the week. Police officers from Romania and Lithuania were also available to check police systems in drivers' home countries to check details supplied by foreign nationals. Throughout the week, the External Communications team tweeted updates from various DVSA check sites. I've picked a few highlights below. At the end of the week, DVSA staff found, 77 offences, 16 defects and issued £2,650 in fixed penalties. Another arrest has already resulted in a charge. Even though I was only taking part in the background, taking photos and tweeting, it was great to showcase all the hard work that’s involved in an operation like this. Operations like this play a vital part in protecting the public from unsafe vehicles and drivers. And it’s reassuring to know that our enforcement teams are out there, working all-year-round to keep you, your family and friends safe on Great Britain's roads. You can see everything the operation found by looking through tweets with the #OpTrivium hashtag on Twitter. It is all very well doing checks on weekdays but come the weekend it's anything goes. I noted a trailer with a bald tyre on a Sunday afternoon recently but no one is interested. It's nice to hear that something is being done with them as I and my drivers see lots of faulty trucks and trailers as they come into the uk via the ports on the Humber. You will need to have multiple sites on the M20 and A2 leading from the docks in Dover to have some impact on these vehicles and there is no assitance from the Police Traffic Devision as it has vertually been dispanded. At the moment DVSA are only sampling the traffic, the vast majority are evading you . A percentage are checked at Dover. I have been pulled in myself on several occasions. 1,168 Defective Lorries all potentially dangerous . Should be an ongoing task every day, not just selecting trucks, how about the many large white vans that drive in excess of the speed limits everywhere and everyday with beaten up side panels, missing lamp lens and scuffed tyre walls ..
Don't see a damaged plastic mudguard as a serious safety defect. Very small level of fines and penalties when considering the size and extent of the operation. Whilst I appreciate getting money in was not the object of the operation I am sure setting out to catch drivers of small vehicles and "farmers" using red diesel for haulage would have been a more cost effective use of resources. The tweets shown here are just a few example of the defects that DVSA found throughout the operation. HMRC were also involved in the operation and were checking vehicles for red diesel. Whilst not wanting to detract from the work done by the DVSA especially relating to foreign vehicles, a search regarding 'accidents by vehicle type' rapidly displays the 'big picture'. The obvious concern is whether the resources available are correctly targeted in an effort to reduce accident rates? Operations like this highlight just how much an on going long term task force is required to target foreign vehicle on our roads. Some of these vehicles only return home 3 or 4 times a year, Inspections and maintenance seem to be at the bottom of many foreign hauliers priorities. Its great to see but i fear that with the lack of resources to much goes on undetected,well done lets keep our roads free from the cowboys. This article started by stating crackdown on "FOREIGN" criminals, there is no mention in the whole article of any foreign criminals being stopped, arrested, prosecuted or apprehended in anyway whatsoever. The article closes by making a larger than necessary issue about the amount raised in fines. As a week long, national ( I think) exercise with the relatively low amount of offences quoted i.e. Arrests and prosecutions, I really must ask, was this the success that is implied? Finally as anLGV driver and operator what is "hgv levy" extremely concerned because I have no knowledge of this charge & certainly never paid it. I will obviously look into this. All the examples shown in the tweets are of foreign drivers who were stopped. The figures at the end show the stops that DVSA officers were involved in - all of which relate to foreign drivers. Operation Trivium went on throughout Europe, and arrests were made by police for a variety of different crimes, not just the ones highlighted here. You can find more information on the HGV levy here https://www.gov.uk/government/collections/hgv-road-user-levy. K. GOLDEN the HGV levy referred to, will be for HEAVY goods vehicles (the key is in the "H" for Heavy) You mention that you are an Lgv driver and operator. The "L" is for Light. (Different from Heavy). £2650 for 77 offences and 16 defects, that is a joke. a UK driver would get more than that for an offence and a minor defect in Spain. Don't you think the word criminal is a bit strong. While I'm all in favour of unroadworthy vehicles being put oft the road most of these people are just normal working drivers, not criminals. I would however like to see a crackdown on criminals who break into our trailers at night or those who steal our diesel. In response to Graham Barkers comment about 'criminals' (whether that description is appropriate or not) - - a person who commits a crime is a -----? you've guessed it !. Or, if you wish an alternative then:-lawbreaker, offender, villain, delinquent, malefactor, culprit, wrongdoer, transgressor, sinner. However I reckon the comment about the "misreants" being 'normal working drivers' is totally off the mark. Responsibility lies with them (and maybe others) for the wrongdoings described and I personally see them as the exception rather than the rule and certainly an exception to the 'normal' conscientious and responsible HGV drivers that do exist. Should have been £26500! The fines in Europe are much higher than here. Well done to all concerned. Something positive to pass on to my `trainees` in Driver and Manager CPC courses. Great, keep up the good work. Still lots to do,these drivers are every where, here in uk and around the world too. Im an ADI and fleet trainer for LGV artics and thats a tough job to be able to change the way of thinking with drivers with understanding and attitude with flowing traffic. Thats not with L drivers, its with exisiting licence holders. It has been better with the interdiction of the tacho card. But still lots to do..
a massive well done to all at DVSA involved in this operation keeping our roads a safer place. as a compliant operator its good to see some of these poorly run foreign operators given the fines and advise they obviously need. keep up the good work..
Why aren't a percentage of vehicles entering the country checked by a permanent facility at the docks? This would discourage badly maintained vehicles in the first place an d checks made for smuggling etc. £2650 in fixed penalties over 77 offences, 16 defects. Laughable. What a waste of resources. No wonder its considered a free for all here in the UK.